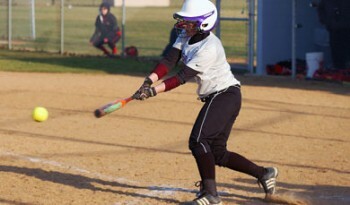 The softball season just ended, but keep an eye on goleafs.net for news about the 2010 season. Photo provided by Sports Information Department. A large incoming class seeks to build on last year’s start. 15 first years will be included in this year’s softball roster. When asked about the outlook for the coming season, Coach Lee Mast said, “I’m excited, I’m fired up, it’s gonna be a fun year…our goal is to compete in conference and be at least a .500 team.” This year’s team looks to be more versatile with much more depth instead of being one-dimensional. Mast says the incoming class will add needed depth, giving the team flexibility in pitching, catching, infield, and outfield. This year’s roster will have a total of 25 players, a great increase from last year’s roster of 16 players. As of now, Mast said that players are competing for their spots. In the infield there are at least two players fighting for each position, making it a tough decision since everyone is closely matched. Some key players to look for will be Stacey Klein and Jana Beitler at shortstop, Bethany Kern and Leah Lehman at 2nd base, returning pitchers Jessica Reed, Diana Stanley, Sierra Van De Keere, and returning catcher Elizabeth Berg, who gets a chance to play with her younger sister, first year Kathryn Berg. Positions for the outfield spots are still up for grabs just like the infield, with many capable players able to play the positions. As the team prepares for the coming season in the spring, coach Mast says, “First years will have to learn how to balance a study table with softball.” This is the first time Mast has started study tables for the team in the hopes of helping the first years ease into learning how to juggle both academics and sports.